Anyone who has played a handful of games of Flames of War has probably noticed that it is easy to mix up teams between platoons. The problem is that when you are looking down at your infantry teams, gun teams, and in some cases even tank teams, everything tends to look the same (they are wearing something called a uniform after all). This can cause issues in the game when you need to remove teams as casualties, determining which platoon has what weapon attachment, or how many teams are in a platoon when it can take it’s defensive fire shots against an assaulting platoon. Most of these issues come up with infantry companies which have platoons which are deployed interwoven, or simply next door to another platoon. It can be very easy to mix up which team is with what platoon. There are loads of ways to mark your units to help alleviate the problems above, and here I am going to show you some of my favorite methods. The easiest thing to do, and what I tend to do with each of my armies in Flames of War is to come up with a simple marking system for the edges of your bases. I have seen some people put little dots on the edges of bases with permanent markers, the number of dots showing what unit a team is part of, but I think you can push this method a little farther. I tend to paint a wide region on the back left side of the base with white paint. I will put one or more colored dashes to illustrate which platoon the team belongs to. The colors and number of dashes that you use to mark the teams can vary in any way you find appealing. 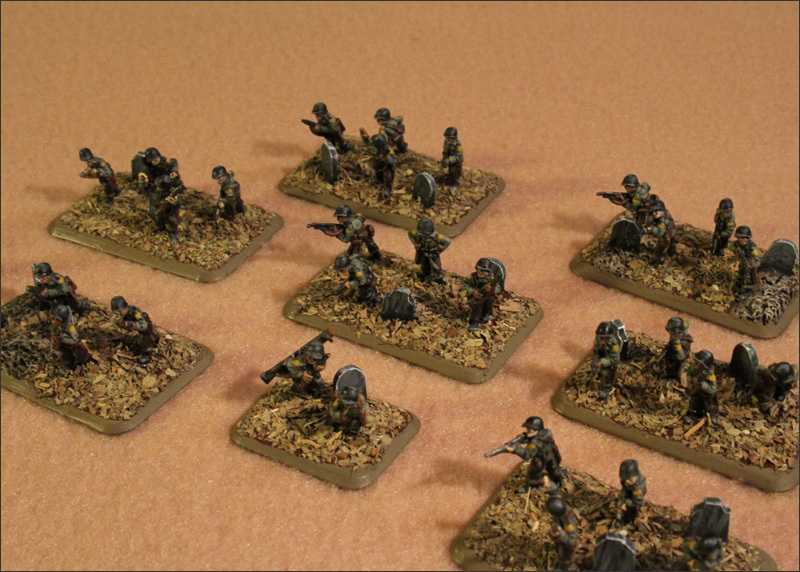 For example I will mark my combat platoons with red dashes, but a different number for each platoon. 1st platoon would have 1 red dash, 2nd 2 re dashes, ect. A weapons platoon would get orange, blue, or other color dashes in the same way. On the white background, these colored dashes really stand out, and are very easy to read. Another step that I like to take is to make an additional mark, sometimes on the right side of the base to mark a special unit. My PAVN Infantry Companies have many RPG teams in them, and it is important to me that I don’t position them incorrectly, or remove them as casualties before I want to. These teams get an additional mark on the right hand side of the base to help them stand out from the rest of the company. Teams such as command teams usually don’t get any additional marking as they are pretty easy to identify from a distance based on their base-size. This method is very easy to do, and makes keeping your teams organized very easy. This infantry team is part of the 2nd platoon. The dark blue dash next to the platoon identifier shows that this is a RPG team. Another method, one favored by my good friend Jason is to give the bases some special detail which will identify them from one another. 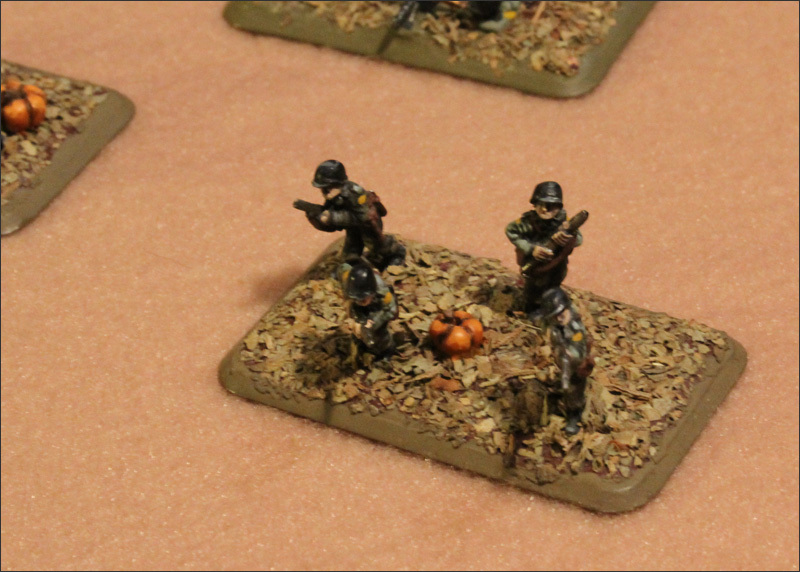 His US Paratroopers combat platoons have either pumpkins (made from greenstuff) or tombstones (made from plasticard) which identify them as either 1st or 2nd platoon. 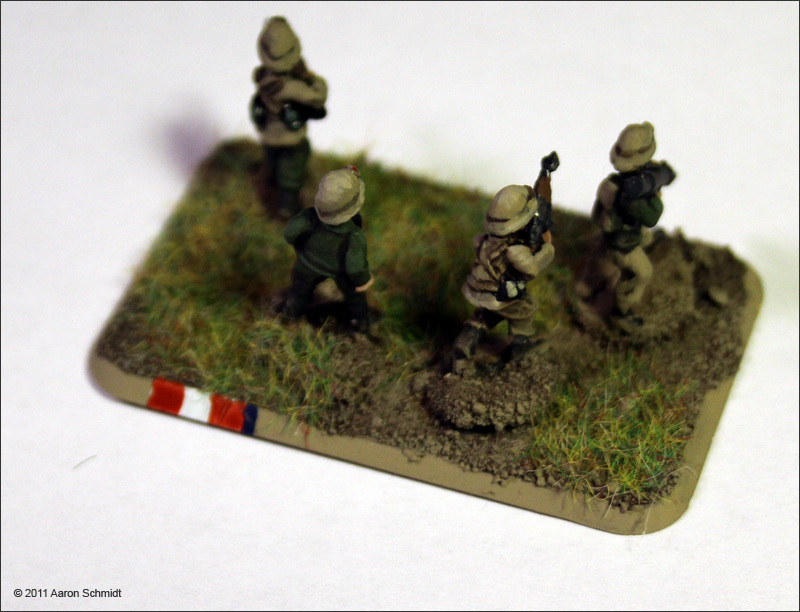 This method, while taking a bit of extra work adds a lot of character, and appeal to a platoon. 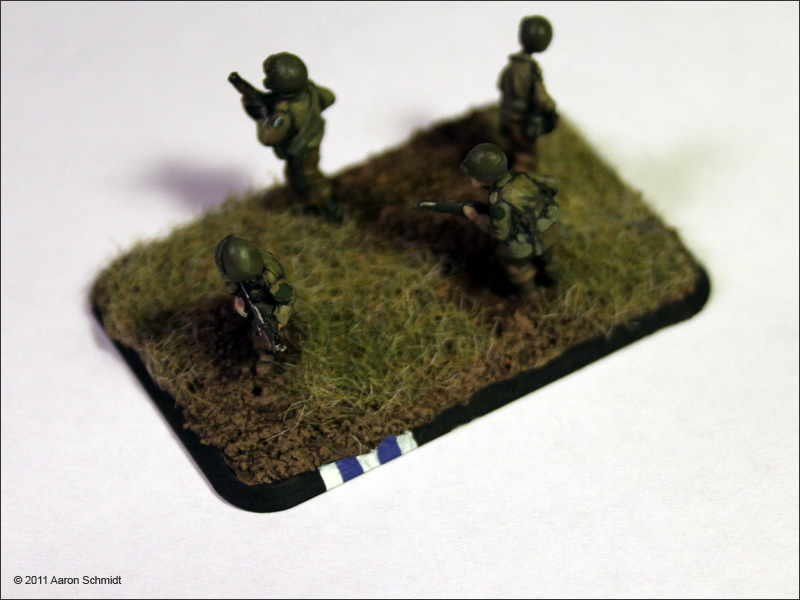 At 15mm, the base of an infantry team is effectively half the model, so extra work put into bases is never wasted. This subtle method can also be used creatively to give an overall theme to your army, much in the way that Jason gave his US paratroopers a Halloween theme. The two primary platoons of Jason’s US paratroopers are defined by pumpkins, and tombstones. These simple thematic devices identify what platoon the team is in while giving the entire army its own flavor. 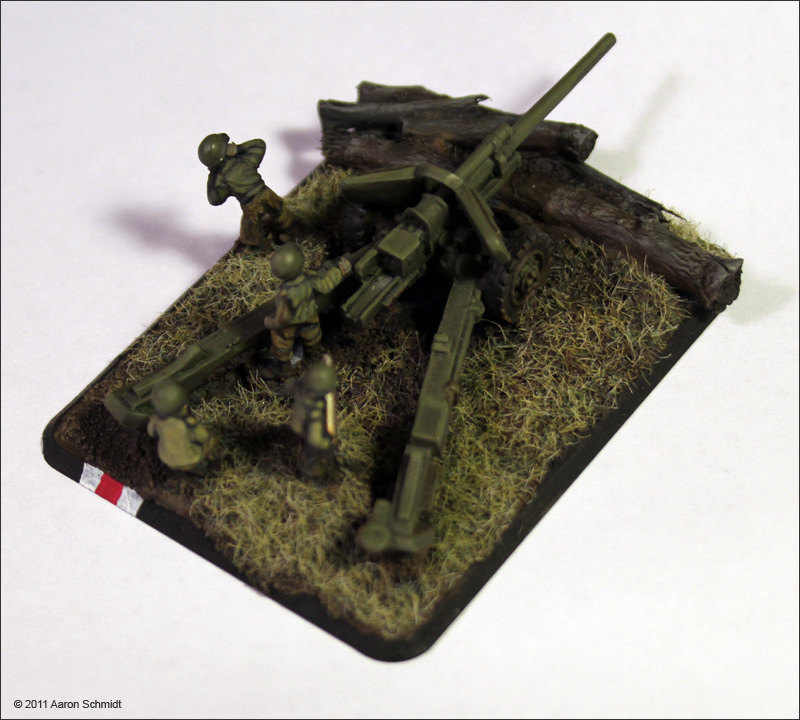 Jason’s Pioneer Grenadiers are a very individualistic unit who’s base really causes them to stand out. 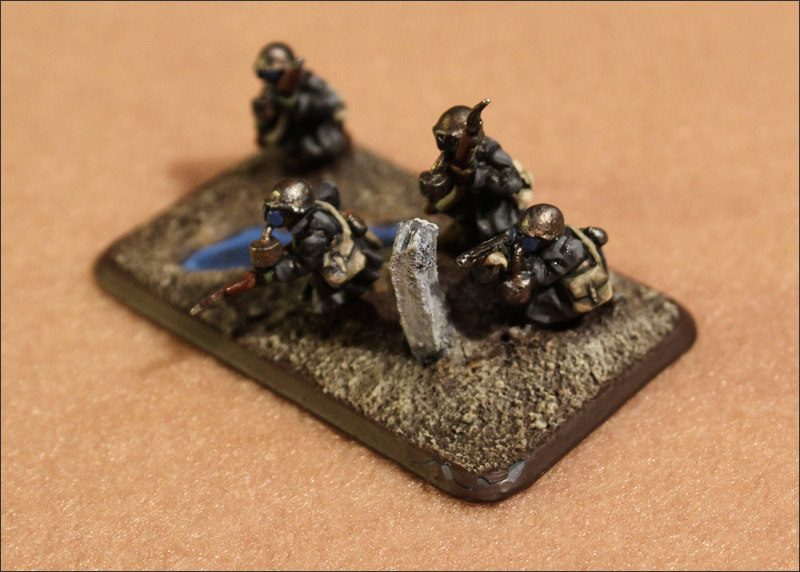 This unit is usually the lone infantry unit supporting his Panzerkompanie, but if he were to add more units, he could apply variations to the basing to both maintain uniformity, and give them some unique trait that he could use to help identify the unit. One popular method for marking bases that I don’t think is very useful is to put a sticker on the bottom of the miniature’s base. While marking the unit this way looks nice (because you don’t see the markings unless you look at the bottom of the base), it makes spot identifying the team impossible, and when it comes time to figure out who is who, you need to physically move the team. This is usually not a big deal, but can occasionally cause troubles. In a tournament I participated in an opponent needed to make sure that the command team that was between two platoons was his 2iC. After picking the team up and checking out the bottom of it’s base, he put the team down around an inch closer to a neighboring platoon. I don’t believe that he was intentionally trying to influence the game, but that fudge could have changed whether both units could link up to provide defensive fire or not. This method is better than nothing, but not ideal. Yeah, that had occurred in one of my games way back when I first started playing Flames of War. I felt really lame when I couldn’t give my opponent a clear indication as to who was part of which platoon. Its a little thing to do to make your army more clear, but it helps in many ways!